CardLogix’s smart cards can replace cash for the purchase of movie theater or sports venue tickets, plus other products and services. The cards can provide customer convenience, reinforce affinity, and create revenue float on stored value. 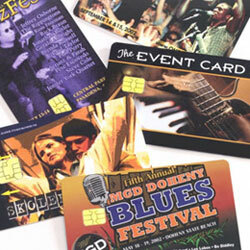 CardLogix has been supplying smart cards in place of tickets and coupons since 1998. This depth of experience can give your program an edge in this media-saturated world of prepaid cards. We recommend that you discuss your project requirements with a member of our sales or engineering staff to help you avoid the many pitfalls we have seen in this competitive environment. CardLogix offers many types of contact and contactless cards and two different APIs that address the ticketing and venue markets: Winplex® as a general purpose solution and the Movie Gold Card™ API, which works specifically as a ticketing payment transaction platform to create an interactive system that is fast and easy to use. The Movie Gold Card API implementation consists of one Windows-based PC, reader, and cards. This base system can expand to include multiple smart card readers, monitors, and kiosks. All encryption, key management, and purse and data files are handled through the API. This can significantly reduce your project time to market. For terminal-based or mixed infrastructure transaction environments, we recommend using our Winplex® API along with other libraries that we can supply based on your specification. CardLogix provides support for a range of options to implement the cards for ticketing and venues. These options can be used with integration assistance from CardLogix or independently, with software and development advice from our Smart Partners.